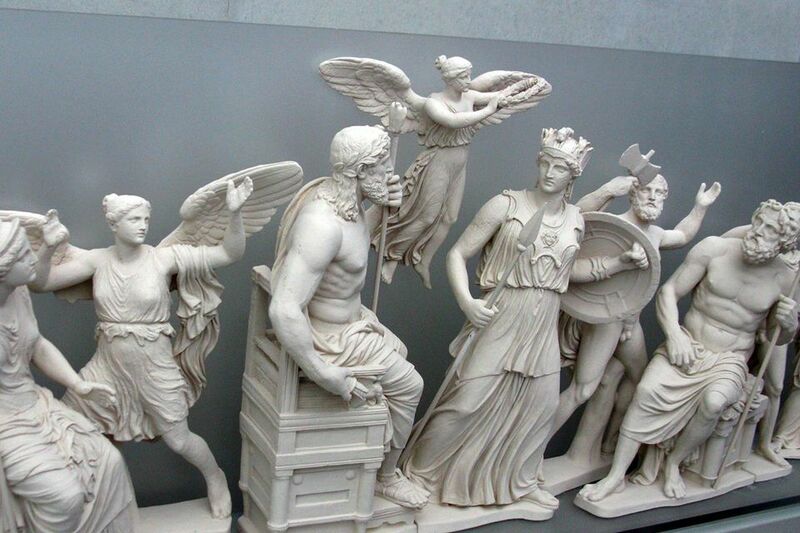 The Greeks didn't have a "Top Ten" list of deities - but they did have the "Top Twelve" - those lucky Greek gods and goddesses living on top of Mount Olympus. Apollo - Beautiful god of the sun, light, medicine, and music. Ares - Dark god of war who loves Aphrodite, goddess of love and beauty. Artemis - Independent goddess of the hunt, the forest, wildlife, childbirth, and the moon. Sister to Apollo. Athena - Daughter of Zeus and goddess of wisdom, war, and crafts. She presides over the Parthenon and her namesake city, Athens. Sometimes spelled "Athene". Hephaestus - Lame god of fire and the forge. Sometimes spelled Hephaistos. The Hephaestion near the Acropolis is the most beautifully preserved ancient temple in Greece. Mated to Aphrodite. Hera - Wife of Zeus, protector of marriage, familiar with magic. Hermes - The speedy messenger of the gods, god of business and wisdom. The Romans called him Mercury. Hestia - Calm goddess of home and homelife, symbolized by the hearth which holds the continually-burning flame. Poseidon - God of the sea, horses, and of earthquakes. Zeus - Supreme lord of gods, god of the sky, symbolized by the thunderbolt. Hades, although he was an important god and the brother of Zeus and Poseidon, was not generally considered to be one of the twelve Olympians since he dwelled in the underworld. Similarly, Demeter's daughter Persephone is also omitted from the list of the Olympians, though she dwells there for one-half or one-third of the year, depending on which mythological interpretation is preferred. While we generally think today of the "12 Olympians", there was a smaller core group of just six who were the children of Cronus and Rhea - Hestia, Demeter, Hera, Hades, Poseidon, and Zeus. In that group, Hades is always included. Who Else Lived at Olympus? While the twelve Olympians were all divine, there were some other long-term visitors to Mount Olympus. One of these was Ganymede, the Cup-bearer to the gods, and a special favorite of Zeus. In this role, Ganymede replaced the goddess Hebe, who is not usually considered an Olympian and who belongs to the next generation of divinities. The hero and demi-god Hercules, was allowed to live at Olympus after his death, and married Hebe, goddess of youth and health, a daughter of the goddess Hera with whom he reconciled. In the past, most American high school students took Greek as part of the standard curriculum, but those days are long gone - which is unfortunate, because that was a natural introduction to the glories of Greece and Greek mythology. But popular media seems to be stepping into the gap with book and movie series which have reignited interest in Greece and the Greek pantheon. All of the Greek gods and goddesses are getting more attention because of many recent movies with Greek mythology themes: Percy Jackson and the Olympians: The Lightning Thief and the remake of the Ray Harryhausen classic, Clash of the Titans, the sequel Wrath of the Titans, and the Immortals Movie, to name only a few.